By thoroughly examining more than a dozen publishing industry contracts, this how-to guide answers the most common questions writers ask about publishing, agency, coauthoring, working-for-hire, and other agreements. This reference breaks down the complex legalese in each contract and provides a clause-by-clause explanation of their contents. Commentary on negotiation points and the consequences related to the absence or presence of critical verbiage will help those—from the most seasoned author signing with a major publishing firm to an author who aspires to publish or is thinking of working with a collaborator on a project—who seek to demystify the process of signing important agreements operate from a more knowledgeable position. Why is it so important to copyright materials? How is a copyright created? and How is copyrighted work protected on the Internet and in other electronic formats? are among the questions addressed in this survey of copyright law written specifically with the rights of writers in mind. Through clear and concise explanations and dozens of useful forms, this manual debunks myths such as the “Poor Man’s Copyright” (aka the “mail-the-manuscript-to-yourself” theory of protecting copyright) and examines the difference between fair use and public domain, the definition of infringement and how to avoid it, how a writer may assert a claim, and how to obtain permissions to use copyrighted works such as song lyrics, pictures, and quotes. A survey of the most recent amendments to the Copyright Act and the impact of those changes is also included. Identifying writers’ most important legal issues, this invaluable legal reference provides straightforward information and solutions on how writers can protect their works. 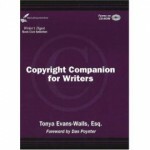 With specific attention paid to intellectual property, contractual electronic rights, reclaiming copyright, fair use, permissions, work-for-hire, public domain, textual referrals, and trademarks, this resource provides information necessary for those looking to sell and protect their work. The appendix includes contract, copyright, and trademark forms commonly used by authors, which are also available in a PDF format on the accompanying CD-ROM.